Goddess Fish Promotions has organized a Virtual Blurb Blitz Tour for Second Time's the Charm: A Romance Summer Box Set by Holly Cortelyou, Ja’Nese Dixon, Khardine Gray, Robyn Rychards and T. S. Sharp, romances available now from Purpose Prevails Publishing. "Let's do the bets before the guys get here." Jennifer smiled. Neil and his groomsmen were meeting them for dinner. It was the chance for everyone to meet properly. "Neil's best man is single and a complete hottie." Jennifer giggled. "Hottie?" Trina asked with narrowed eyes. "Can you even say that anymore?" "Yes, because my Neil knows I think he's the hottest of them all. Anyway, I've known his friend for years, and I always thought he'd be nice for one of you two. I don't know the other guys that well but this guy has the full package." Trina rolled her eyes. "Mandy can have him. I bet twenty she'll be the wedding hook up." "Me?" Mandy pointed to herself. "I bet thirty it's you." "Okay. I'll go with Mandy and Jennifer, Trina," Lizzie said. "I'm going in big for a hundred." Jennifer smiled. Trina shook her head. Jennifer always went in big. It was sad that this time she would lose a hundred bucks. That was a decent pair of shoes or a nice top in Nordstrom. It was so silly to waste so much on a bet. "Oh you would wouldn't you," Lizzie grumbled. "I bet one fifty on Mandy then." "Oh look. They're here, and there he is." Jennifer beamed. They looked across the restaurant, over the crowded tables to the entrance where more people were coming in to start their evening. Trina saw Neil first. He'd had his black hair cut into a neat style that allowed him to keep his locks. Dressed in a white cotton shirt and dark trousers he looked elegant and carried his tall, muscular stature with grace. Trina thought he moved as if he were floating towards them. No, not them. He floated towards Jennifer and had the look of love all over him. Jennifer smiled at him and blew a kiss which he made a show of catching and placing on his heart. Mandy and Lizzie both awed and cooed. Trina looked back to Neil and saw two dark haired guys next to him that she didn't recognize. "It's the guy behind Neil. The really tall gorgeous one with all the muscles." Jennifer giggled. "There." Trina followed Jennifer's gaze and looked behind Neil. When her eyes landed on the man Jennifer was referring to, her whole body froze. Completely froze. She was sure her heart had stopped too because she couldn't feel it anymore. Trina drew in a sharp breath and choked back a cry as spasms of shock erupted within her. She felt faint and feverish both at the same time as she continued to look at him in an attempt to work out if her mind was playing tricks on her. Prolonging her stare confirmed it was not. She'd recognize him anywhere. Yes, he was tall - six feet four to be exact - and still gorgeous with his Hollywood good looks, muscular physique and shiny blonde hair. But this guy was deadly. 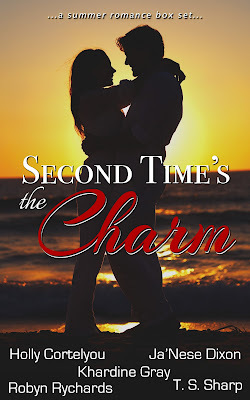 Holly Cortelyou is a romance author who pens sweet and spicy small town, contemporary romances as wells as supernatural and paranormal historical romances. On any given day, Holly can be found sipping coffee and surfing Facebook for gossip on royals, college football (Go Ducks! ), knitting, and ghosts! After trying on many hats as a meeting planner, political scientist, long-haul trucker, and financial services specialist, she’s finally found the perfect fit as a romance writer! Holly’s living her own Happily Ever After with an uber-handy and sexily broad-shouldered husband, and a fluffball kitty in sun-kissed Southern Oregon…and an exuberant lab puppy who rules our hearts! She has hazel eyes and a goofy sense of humor…all the rest is subject to change without notice. You can always find her at www.HollyCortelyou.com and holly@hollycortelyou.com. Ja’Nese Dixon pens tales of romance in several sub-genres. But her favorites are the ones that manage to keep readers sitting on the edge of their seats lying to themselves about reading “just one more chapter”. Ja’Nese is an avid reader and coffee drinker, who also loves to run, cook, and craft. Her ultimate goal as a writer is to give you a little “staycation” with every story. And she aims to make this present story no exception. Sit back, grab a snack and enjoy. Ja’Nese calls Houston home with her husband, three kiddos and a four-legged diva dog. Visit her website at www.janesedixon.com if you enjoy romance, suspense and good stories. Robyn Rychards grew up in the granola bowl of the United States, Boulder Colorado, a town filled with fruits, flakes and nuts. She considers herself a Jack-of-all-trades-master-of-none and has taught herself to sew, paint, play the piano, garden, cook, the list goes on. But now that her books are published, she’s thrilled to finally be considered a master of one. At least as much as a person can be, for the learning never really stops. She feels her active imagination is a blessing and a curse, with the blessing far outweighing the curse since it has led her to fulfill her dream of writing for Harlequin. Robyn started writing stories when she was a teenager because she didn’t have enough books to read. Sometimes she finds it hard to believe that people are willing to pay her to do something she enjoys so much, but mostly she’s happy to have such a wonderful excuse not to cook and clean. And a job that means you can stay in your jammies as long as you want? Priceless. She also loves to hear from her readers, so send her an email at robynrychards@gmail.com. You can get in touch with her on Twitter, @robynrychards. She loves meeting new people on Facebook too and can be found under her name, Robyn Rychards. Check out her web page at www.robynrychards.com for details about her books and upcoming releases. T. S. Sharp, AKA Tierra, is a driven, passionate and charismatic author hailing from Mobile, Alabama. A self-described “twenty-something introvert”, T. S. Sharp is truly passionate about anything that concerns words and reading, and she would often spend her time reading even beyond her school obligations, often resting in her bed with her trusty kindle and a wealth of amazing literature at her disposal. Although she is debuting with her first work, Tierra is a very flexible and eclectic writer with a very kaleidoscopic taste: she loves to read different genres and therefore, she creates very diverse stories in her head, unleashing the full potential of her creativity and sharing her ideas with the readers in a unique and refreshing ways. $25 Gift Card and five (5) bundle from us. All entrants receive five stories for your eReader. The authors will be awarding a $10 Amazon or B/N GC plus a book from each author to a randomly drawn winner via rafflecopter during the tour. Thank you to Readeropolis for hosting us today! 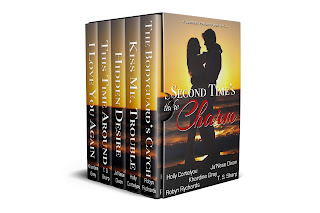 Our boxed set is all about summer getaways and second chances at love. Do you have a favorite vacation spot or somewhere you've always dreamed of escaping to? I love camping in the mountains...especially the Rockies which is where Kiss Me, Trouble takes place. :-) That being said, I'm always ready for a tropical retreat to Maui or Jamaica. Happy reading and have a great day.